"Please do not stay down, do not stay stuck, do not mourn," Angelique Smith said. "Because Nipsey is great. And now he's even greater because he has no bounds and no limits." 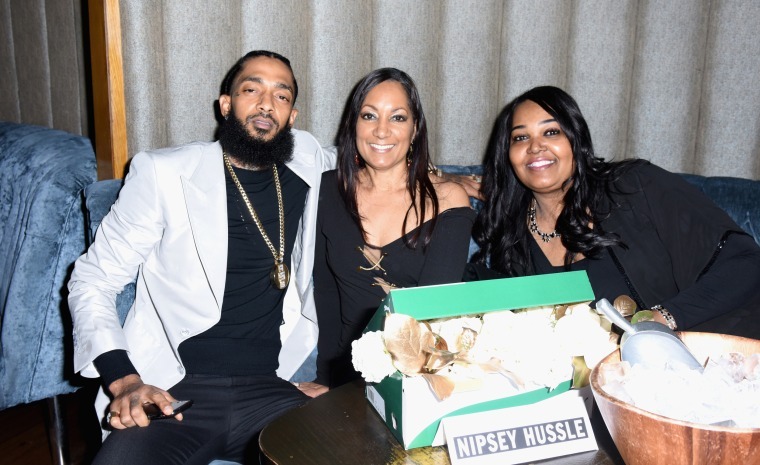 Rapper Nipsey Hussle's mother shared words of encouragement with those mourning the death of her son. In an almost nine-minute video posted on Facebook on Tuesday, Angelique Smith said death is not something to be feared and described how Hussle, whose real name was Ermias Asghedom, looked after he was fatally shot outside his clothing store Marathon Clothing, in Los Angeles on March 31. "I have strength, and I want to lift you up," Smith said. "Please do not stay down, do not stay stuck, do not mourn. Because Nipsey is great. And now he's even greater because he has no bounds and no limits. His energy is everywhere. He's there with you now and he's here with me now. And please be encouraged." Smith said her son, who was a community advocate for his native South Los Angeles and renowned for his kindness, appeared beautiful and peaceful after his death. “When you walk this earth and you do good deeds for people and you are loving and kind, those are the things that will show on your face — you will look more beautiful," Smith said. "Ermias looked healthy, he looked clean, he had a glow." She continued: "He did not look scary. He did not look like he was shot. None of the trauma … the way that he left this earth, none of that showed on his face. He looked like a radiant, clean, beautiful light being. Nothing negative." Eric Ronald Holder, Jr., was charged last week and pleaded not guilty in the shooting death of Hussle, 33, that left two others wounded. Hussle died from gunshot wounds to his head and torso, the Los Angeles County Medical Examiner-Coroner said. A memorial will be held for the Grammy-nominated rapper on Thursday at the Staples Center in Los Angeles.